Now I wonder if this mysterious event in Orlando that my Grandmother would not even talk about on her deathbed drove Mother to take up with a new protector. As soon as Cecil entered our lives, we moved. First to a different house in Orlando, and very soon after to Jacksonville. I didn’t see my father again until I was 25, just a few years before he died. For a long time I pretended he was coming to get me every day. I had to face the reality that he wasn’t going to come. But it was years before the hope died completely. Cecil became very quickly attached to me. He was very attentive and, hard as I have tried to remember if there was anything suspicious about this, I can remember nothing inappropriate about his conduct toward me. He was “fatherly” and “proud” of everything I did. At first, I was put off, because I was still waiting for my father. But after awhile I accepted his attention and soon came to be fond of him. This wasn’t strange, since I rarely received any special attention from my mother. Curiously, Cecil disliked my brother, and was unable to conceal it. When I discussed it with her, my mother remarked that this had been a “painful” realization. Cecil apparently had a job offer in Jacksonville, We moved into a house close to the beach. It was 1956. There are three Navy bases near this city. The Navy, and the bases, were to play a part in my story. It was in Jacksonville at the house near the beach when the Face at the Window came. Life was certainly strange on the planet of Lost Boys and Girls. And it was going to get even stranger. In later years my mother and grandmother told me about these events. Yes, I have my own memories, but I was not included in adult policy conversations. Also, I was protected from the knowledge of certain events around me. When working on this book, when I asked my mother about this period, she deliberately evaded important issues and refused to help me work on uncovering the true sequence of events. And, unfortunately, there are no photographs from that time; if there ever were, Mother must have destroyed them. “There are many things that ought to be forgotten,” she liked to say. Maybe that’s true in some cases, but in this instance, every clue could lead to understanding of a very great mystery. With help from my husband Ark and my brother Tom who also questioned her at various times, I’ve been able to put together the idea that early in the marriage, Cecil started to exhibit bizarre behavior. Yet the details Mother was willing to give us were peculiar. The strange, ritualistic way Cecil handled his food when he ate; the unusual way he used his knife and fork; how he would be meticulous and finicky one day, and a completely different person with hideous personal habits and language the next. She seemed to be describing someone with multiple personality disorder or some form of schizophrenia. Mother said she came home one day and found Cecil huddled in the closet in a fetal position, crying, talking crazy about “Them”. In the next strange episode, she smelled smoke, went to investigate and caught him building a fire under the fuel tank outside the house. This was followed by a horrific suicide attempt. Cecil was standing at the bathroom sink slashing his wrists over and over with a razor blade. Blood was everywhere. Cecil fought violently against her attempts to get the razor away from him. She wrapped towels around his arms and called an ambulance. She emphasized that her main concern at the time was to prevent me and my brother from being exposed to this sort of thing. Cecil was admitted to the hospital. In the course of a police investigation into the incident, Mother had learned there was an ugly secret that he and his family had been hiding from her. This turned into a rather tricky situation. Although he had been released, he had never been declared “cured”. The validity of Mother’s marriage to Cecil was in question. He was considered to be legally incompetent to enter into a contract. Not only that, he had a first wife from whom he had never been legally divorced for the same reason! After a short while in the hospital at Augusta, where he had been sent after the suicide attempt, Cecil begged my mother to come for him. Even though there was a big question about the legality of their marriage, apparently no one but my mother could sign him out! He was also calling his family as well, so they soon began pleading with Mother, promising they would take responsibility. She was reluctant until one of the doctors told her that Cecil was “ready to be released” if she would come and take care of the paperwork. Now this is singularly strange. Supposedly she is not even legally married to him, yet she is the only one who can sign him out of the hospital? And the doctors asked her to do it also? Mother drove to Augusta, where the doctors assured her that anything he had ever told her about his experience in the Navy was simply untrue and that she was not to believe a word. It was all fantasy. She vaguely recalls that Cecil had talked about being in places and doing things that she could only describe as “out of a spy movie” or “it was just crazy stuff”. After she checked him out of the hospital she claims that this was the last time she saw him. I was almost five years old then. Mother had suffered for years from debilitating headaches that left her completely unable to function for up to a week at a time. During one of these episodes, a neighbor had come over to help her get my brother and me settled for the night. But I remember hearing quiet conversation in the next room even though my mother swears that she was in her bed. My bedroom opened off a small hallway that opened into the dining room, so that a shaft of light came in through the door left slightly ajar. I was lying in the bed listening to the grown-up voices murmuring in the background and drifting off to sleep when, for some reason, I looked at the window. Something had caught my eye. Something wasn’t right. Of course, after the previous window event, I didn’t trust windows at all. But it also seems there was some particular “tension” in the air that I cannot describe or define. I do recall lying in bed, starting to fall asleep, and suddenly watching that window as though I expected something to show up there. To my horror, I noticed the window slowly opening! I called my mother. She came in, told me there was nothing there, shut and locked the window, and went out of the room. I was still upset and kept watching that damned window. Sure enough, it started easing open once more. Again I called Mother. She shut and locked the window again. I kept watch. And, for the third time, it started opening, so slowly that I was not sure that I was seeing it. But when it opened an inch or so I called Mother again. As it happened, she had been standing in the hall, peeking through the crack in the door to catch me “playing a trick”. She had my feet in view, and saw clearly that I hadn’t moved from the bed. So, when I called this time, she knew I wasn’t the one opening the window, and it became a serious matter. As she told us later, the neighbor lady called her son, who came over with a loaded gun and investigated the premises inside and out. I was also told that the neighbor’s son was stationed in a chair with his gun in my darkened bedroom to wait for the next occurrence, but I certainly don’t remember that part of it. After awhile, the window began to open again. The story becomes garbled at this point. Someone went out the back door and someone else went out the front door to “trap” the culprit. In the earlier version of the story, Mother said she and a friend went out the front, but later she claimed she did it alone. Nevertheless, as soon as they reached the corner of the house a “white figure” went flying past across the street and into the nearby woods. It happened so fast that, to this day, she can’t say what her real impressions were. She was convinced that it was Cecil playing tricks and, believe it or not, didn’t consider this a serious threat! No one figured out how the locked window unlocked itself three times in a row. After she claimed she locked the window each time, I asked her how she could explain this problem of a magically unlocking window. A glazed look came into her eyes. She looked trapped. She then declared that she was sure there was no lock on the window at all, so she must have been mistaken. Yes, that was it. There was no lock. Cecil was just “playing a trick”. Isn’t it amazing how desperate we are to “normalize” things? 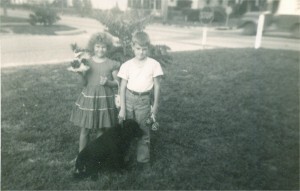 One day, rather soon after this, I was sitting on the porch playing with my toys. Mother was inside making lunch or something. Cecil came up to the house. He told me he missed me and my mother and he was coming home for good very soon. I was happy to see him because he had always been attentive and kind to me. He told me to not tell my mother that he had been to see me because she would be mad at him. He was trying to make her understand that he loved all of us and he wanted to bring her a nice surprise. It would be a “secret”. Would I like to go for a ride one day soon? I had some idea I wasn’t supposed to do this, so I said “no”. But then, for some reason, I told him I would only go for a ride if it could be in a new yellow and black convertible like I had seen in a picture in a magazine. Why I was so taken with the idea of this yellow and black car, I’m not sure. The next day, I was out playing on the porch again when Cecil drove up in a brand new yellow and black convertible exactly like the one I’d seen in the magazine. He hopped out and said he had bought it just for me. I wasn’t exactly dressed to go for a ride since I was playing in a tee shirt and my underwear. Cecil reassured me that it would be just around the block. Nobody would see me and no need to tell Mother, because we would be back before I was missed. W e drove on. Out of the city, down along two-lane blacktop road through a forest. I realize now this was a plantation pine forest because all the trees grew in straight rows. Finally, we turned to the right onto a side road that was just a track cut through the trees. He drove probably a couple more miles until we came to a large, perfectly square clearing in the middle of this massive forest of tall, thick trees. Everything was cleared; not a single tree or shrub in sight. But right smack in the middle was a small white building and an outbuilding resembling a tool shed or large pump house to the rear. Two or three men dressed exactly alike in light tan pants and shirts were standing on the steps along with a woman dressed all in white. They smiled at me, and my stepfather nudged me toward them. They murmured comments like “So here she is! We’ve wanted to meet you! How adorable you look. Oh, we’ve waited so long for you to get here!” and so on and on. It was the usual overdone adult way of talking to a small child, and I recall being put off by it immediately. I was ushered into the house. They indicated a chair at a dining room table where I was to sit. I sat and they sat. We were sitting all around this table looking at each other. I wondered what I was doing here. One of the men began to ask me questions in a condescending voice, though I really can’t remember what these questions were. All I remember saying is that I wanted to go home, that my mother would be missing me. They acted hurt and repeated how special I was and how long they had waited to meet me. I was becoming more and more uncomfortable. I repeated that I wanted to go home. I remember them looking at each other and my feeling that something had changed subtly. The woman in white more or less took over. That seemed reasonable. It was my usual nap time. I was led into a bedroom toward a shiny metal crib with very high sides. I really wanted to go home. I wanted to get this nap over and done with so I could leave. I was too old for a crib, I thought to myself. These people must not know much about little girls as grown up as I was. And this made me suspect maybe my mother didn’t know I was there with these people after all. But they were so happy to see me and had worked so hard to prepare a special room for me. And they promised I could go home after the nap. So I resolved to say nothing, to be a “good girl,” and not to be rude. After I was settled into the crib, the woman said: “Oh! You need a bottle! It will help you sleep better!” And she left the room. I remember thinking to myself: “These people don’t even know that I am too big for bottles!” But, being a good girl, I wasn’t going to be rude and say so. Let’s get the nap over! I am in the car with Cecil and we are going very fast down a road with red flashing lights of a police car behind us. He is driving crazy, dodging cars, driving up into people’s yards, zigging and zagging around trees and along sidewalks. And then, suddenly, up a steep sloping lawn and dead-on into a palm tree! I flew forward. My face hit the dashboard and blood was running into my eyes. A group of policemen came up to the car. Several took my stepfather out on one side of the car and handcuffed him. I was taken out the other side of the car by another policeman who took me to his car to drive me home. Now, that is from my memory. The other side of the story was filled in by my mother in recent years after I’d shared my memories with my brother. We decided to ask her about it. Apparently, there was something about this incident that was unusual, even though I believed I had simply been taken by my stepfather to visit his family. Perhaps my mother had hoped I wouldn’t remember this incident at all. When she realized that I had, she told me “the rest of the story,” but the parts she still wouldn’t talk about are troubling. According to my mother, when she began to search for me, a neighbor told her that I had gotten in a car with Cecil. Mother called the police. Embarrassed to say that Cecil was a mental case, she told the police she was worried because Cecil might have been drinking. The police told her the law gave him the right as a stepfather to take me if he wanted. And as for the drinking, unless he broke the law they could do nothing. She tried to wait it out, thinking that Cecil was only going to scare her a little bit. But as the hours passed with no sign of me, she called my grandmother in Tampa. My grandmother, a veritable tiger when it came to protecting me, sent a telegram to my grandfather, who was on an out-island in the Bahamas on a consulting job. The telegram had to be flown out to him in a small company plane. Grandpa flew back to the main island, caught a flight to Miami, then another to Tampa, got in his car, and drove to Jacksonville. All this took several days. Once Grandpa arrived in Jacksonville, he apparently put on some pressure to activate the “manhunt”. Mother is vague on what he actually did, but when Grandpa wanted something accomplished, he had ways of getting it done. So, with the neighbor’s description of the car, the police were looking for Cecil. It seems that he was on his way to “return” me when he was spotted. But we can’t really know that for sure. Cecil was taken into custody and put in the drunk tank overnight. The next day, my grandfather took my mother down to the police station to sign the papers to press charges against him. But Cecil was already gone. Mother recounts that my grandfather was furious and demanded to know why they had let him go. Grandpa was taken aside privately and told that the police could do nothing. Grandpa gave Mother a brief, edited version of the conversation afterward. A representative from the Navy had come to get Cecil. They were able to do this because their authority “superceded civilian jurisdiction”. The police had no choice but to release him to the Navy. Cecil could have called his family, who then could have requested that someone from the veterans’ hospital go to pick him up. But such action suggests a “reaction time” beyond the ordinary case of a veteran with mental problems on the loose in the civilian world. To send representatives from Augusta to pick him up overnight is fast work, for sure. Of course, with all the local Navy presence, it would have been just as easy to send someone from one of the bases. But why was this done so quickly, before any formal charges could be filed? Finally, if Cecil was just an ordinary nutcase, why didn’t they just leave him there to be dealt with by civilian authorities? No record of the event existed. 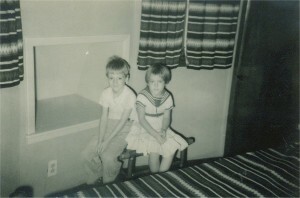 Immediately after the kidnapping: My brother and I in the "Tepee Motel". My grandparents took us from Jacksonville back to Tampa and left my mother to pack up the house and move. This is one of only two photographs from that time. My grandfather immediately moved us to a small house in Tampa near his own. We were there for a just a little while. I had my tonsils out, and started school. Mother could not divorce Cecil because he was incompetent, and at the same time could not be legally married to him for the same reason. She said she did not receive any cooperation from the Navy or the veterans’ hospital in trying to sort through this process. Then Cecil called Mother at work one day. He was out of the hospital and he was coming to get me. She left work, went straight to the school for Tommy and me, and left town immediately under the protection of a family friend. We went to a fishing resort some fifty miles away, where we stayed till my grandfather could come back from the Bahamas again. For me and my brother, being set free from school was a lot of fun. Living in a resort cabin on the water, fishing, going for boat rides and eating in restaurants was a great adventure. We had no idea there was a madman on the loose trying to get to me, and that the forces behind him, thwarted in one way, would begin taking another approach. In retrospect, it is clear now that someone wanted to get their hands on me very badly, and someone else had an equal interest in preventing this.